Today Matilde and Aitana did the pioneering walk from El Parral to Orxeta, our new local village. It is four kilometres away and the walk is really safe for donkeys: mostly off-road dust track. The proprietors of the Bar Plaça in Orxeta, Gali and Trini, have been very welcoming. They were expecting the donkeys today and had their grandchildren there to see them. What a contrast with the bullies of Finestrat who forced us to stop walking the donkeys into the village! Here in Orxeta at the Bar Plaça we have a traffic-free safe place to stop for a drink and a meal. Matilde doesn’t like the beer. I offered her a cupped palm-full and she immediately washed her mouth out in the water bucket. Good taste, donkey: you know Estrella Galicia and you will accept nothing less! The walk home from Orxeta. Aitana (in green head collar) looking at the Aitana ridge from which she is named. Our house is in the valley below. Such a lovely walk. And thank you Orxeta for the welcome! For those who missed it first time, here is the video of the bullying “hunters” of Finestrat. Supported by the Mayor of Finestrat “Juanfran” (what kind of name is that for a mayor?) who is their protector and guardian. A man who existed as a shadow puppet under the previous administration of the excellent mayor Honorato Algado, and who will hopefully never be re-elected again. Oh Gareth! Didn’t realise things had been so bad in Finestrat! God Bless all of you. All Finestrat dust can now be shaken off – onwards and upwards. Thank God you and the donks have found your Shangri La. Great to hear your new village sounds so welcoming…that’s what it should be like. 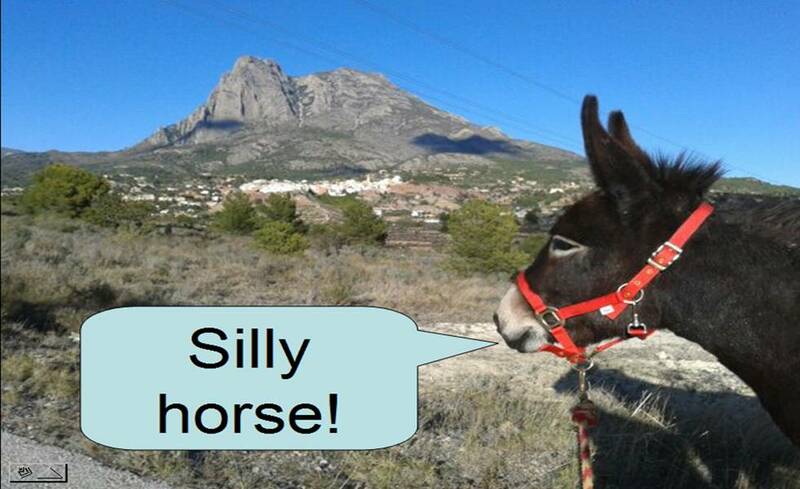 Why did Finestrat villagers not want you bringing the donkeys to the village? Sound like morons to me. It ia such a difference! People in Orxeta very welcoming. Not only that but it is a safer village. We enter from a dust track straight into the old centre of the village and there is no need to walk donkeys in the main street with mad traffic like in Finestrat. Orxeta is a great place. Lovely neighbours in my valley. Everyone is thrilled to see the donkeys. Which brand of beer precisely did poor Matilde feel moved to spit out again ? Mahou (Red label). Maybe we’ll try Mahou (Green label) next time? Ah, yes the red can be hard to swallow.